Learn how to conveniently access multiple Alibaba Cloud ECS instances over the internet with Apache Guacamole. Written by Liptan Biswas, Alibaba Cloud Tech Share author. Tech Share is Alibaba Cloud’s incentive program to encourage the sharing of technical knowledge and best practices within the cloud community. Apache Guacamole is a free and open source web application which lets you access your dashboard from anywhere using a modern web browser. It is a clientless remote desktop gateway which only requires Guacamole installed on a server and a web browser supporting HTML5. With Alibaba Cloud, you don't need a physical hardware to keep a desktop, but you can use its virtualized hardware to create as many cloud instances as you want. Guacamole is the best way to keep multiple instances accessible over the internet. Once you add an instance to Guacamole, you don't need to remember the password as it can securely store the credentials. It also lets you share the desktops among other users in a group. Guacamole supports multiple connection methods such as SSH, Telnet, VNC, and RDP. In this tutorial, we will install Apache Guacamole on a CentOS 7 instance. We will also secure the connections to the web application using NGINX reverse proxy with SSL. Alibaba CentOS 7.4 instance with at least 2GB RAM. Firewall or Security group rules configured to allow ports 80, 443, and 8080. A domain name that needs to be pointed towards your ECS instance. Install the EPEL repository, as a few of the dependencies are unavailable in the default repository. The above command will install all required dependencies required to successfully compile the source code and also to provide the support for VNC, RDP, and SSH. Install FFmpeg to enable support for session recording. FFmpeg is available in RPMfusion repository. The Guacamole system is made up of two separate parts: the Guacamole server and the Guacamole client. For Guacamole to work, both of these tools must be installed. The Guacamole server consists of the native server-side libraries required to connect to the server and the "guacd" tool. guacd is the Guacamole proxy daemon which accepts the user's connections and connects to the remote desktop on their behalf. Below is the architecture of the Guacamole system. You will need to compile and install the Guacamole server on the host machine. Installing the binary is not possible for the Guacamole server. Download the Guacamole server source code files into the temporary directory. Extract the source code archive. Compile and install the source code. The installation will also set up an init script which can be used to manage the guacd daemon. Create the necessary links and cache for the shared libraries. Unlike the Guacamole server, the Guacamole client does not need to be compiled and installed from source. A cross-platform Guacamole client binary is available to download and install. Guacamole binary requires a Java web server to run. In this tutorial, we will install Apache Tomcat 8 to run the Guacamole binary file. Install Java 8 runtime on your server. Installing JDK is not required since we do not need to compile any Java code. Create a new group and user for Tomcat installation. Running the Tomcat server with an unprivileged user is recommended for security reasons. Download the latest Tomcat server of version 8.5 from Apache mirror. Extract the archive into /opt/tomcat directory. Provide appropriate permissions and ownership to Tomcat server files. Create a new systemd service file for managing the Tomcat server. Populate the file with the following configuration. Start the Tomcat server and enable it to automatically start at boot time. You can check if Tomcat is running by going to http://your-server-ip:8080 using your favorite web browser. You should see the default Tomcat page. If you are getting an error, then make sure that port "8080" is allowed in Security group rules. Since we have installed the Tomcat server, download the Guacamole client binary file using the following command. Move the Guacamole client file to the Tomcat's webapps directory. The Guacamole client is now installed on your server. You can check if Guacamole client is working by going to http://your-server-ip:8080/guacamole using your favorite browser. You should see the Guacamole login interface. You will not be able to log in yet, as we have not configured authentication yet. The Guacamole client supports multiple authentication mechanisms such as file-based auth, database auth, OAuth, and LDAP. In this section of the tutorial, we will configure the database authentication using MySQL database server. MySQL database will be used to store the authentication and other data. Since we do not require high performance and scalability which ApasaraDB provides, we will install MySQL server on the same ECS instance. Install the MariaDB server, which is an open source fork of MySQL. Start the MariaDB server and enable it to automatically start at boot time. Set a password for the MySQL root user and secure the server instance by removing the test database and user. Now login to your MySQL shell using the root user and the password you just created. Run the following queries to create a new database named guacdb along with guacdb-user having full access to the database. Please change StrongPassword to a very strong password. Now that our database server is running, we need to install the MySQL connector and Guacamole JDBC auth plugin. Create new directories to store the plugins. Download the MySQL connector extension from the MySQL site. Extract and move the MySQL connector into /etc/guacamole/lib. Download the Guacamole JDBC authentication extension from the Apache Guacamole site. Extract the archive and move the extension to /etc/guacamole/extensions directory. Since we have already created the database and database user, we can proceed to create the database schema and import the initial data. The schema is shipped along with the JDBC extension. Import the SQL schema and initial data into the guacdb database using the following command. Provide the password of the MySQL root user when prompted. Create a new configuration file for Apache Guacamole so it can override the default configuration. Populate the file with the following configuration. Make sure to edit the StrongPassword with the actual password of guacdb-user. Set GUACAMOLE_HOME environment variable so that the Guacamole server can read the configuration file and the extensions. Disable SELinux as it causes errors when running Guacamole. Restart the Guacamole proxy daemon and Tomcat server so that the new configuration can take effect. The Guacamole client authentication is now configured on your server. You can check if you can log in by going to http://your-server-ip:8080/guacamole using your favorite browser. Log in using the default administrator user guacadmin and password guacadmin. Setting up a reverse proxy secured with SSL is recommended to encrypt the data exchanged between the browser and the Guacamole server. This will also map a domain name to your server so you won't need to remember the IP address of the server. Install the NGINX web server. Start the NGINX web server and enable it to automatically start at boot time. In this tutorial, we will use the certificates generated with Let's Encrypt certificate authority. If you wish to use more production-friendly certificates, you can purchase commercial certificates from Alibaba Cloud. Download and install Certbot. Certbot is an official client application for Let's Encrypt SSL generation. Note: Before requesting SSL certificates, make sure that the domain you are using is pointed towards the IP address of the ECS instance. If not, make an "A" type record in DNS management panel and point the domain or subdomain to the public IP address of ECS instance and wait for the DNS to propagate. Generate Let's Encrypt SSL certificates for your domain. Create a cron job to renew the certificates, as Let's Encrypt certificates expire every three months. The above command will run the renewal command every day at 2.36 AM. If the certificates are due for expiry, it will automatically renew them. Create a new server block configuration file for the Guacamole web application reverse proxy. Populate the file with the following configuration. Replace the example domain name with the actual one. Make sure that the path to the Let's Encrypt SSL certificate as well as the private key are correct. Check the NGINX configuration for errors. Restart the NGINX web server to implement the changes in the configuration. Now you can go to "https://guac.example.com" to access the Guacamole dashboard. The connections to the server and the browser are also secured with SSL. The Guacamole server is now ready and working. You can add as many remote servers as you want. It can connect to remote clients using SSH, Telnet, RDP, and VNC. To verify if it can connect to the remote server, let's add our first SSH-based connection. Before proceeding further, let's change the password of the default "guacamole" user. Log in with default administrator user "guacadmin" and password "guacadmin" and go to the "Preferences" tab. Change the default password from this tab. To add a new connection, go to the "Connections" tab and click on the "Add New Connection" button. Provide a name for the connection and choose the protocol from the drop down menu. Since I am connecting to the Guacamole server via SSH, I am selecting "SSH." 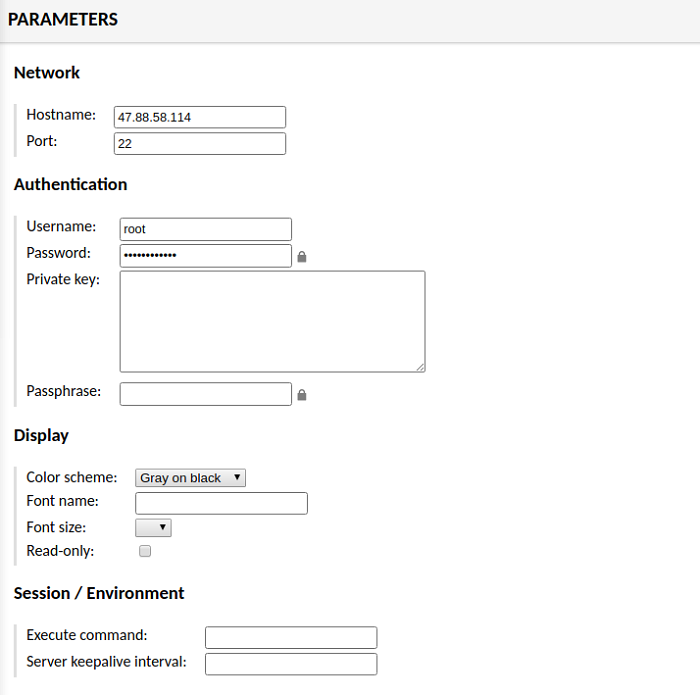 In "Parameters," provide the hostname of the target server and port. You can also use "localhost" for connecting to the same server. Provide the username and password. If you're connecting through the private key, then provide the contents of the private key. You can also configure the display, such as color scheme and fonts. Once you are done, click the "Save" button. Similarly, you can add more SSH clients and graphical dashboards using various connection methods. Remote connections you want to add are not required to have either the Guacamole server or client. You can directly add them. 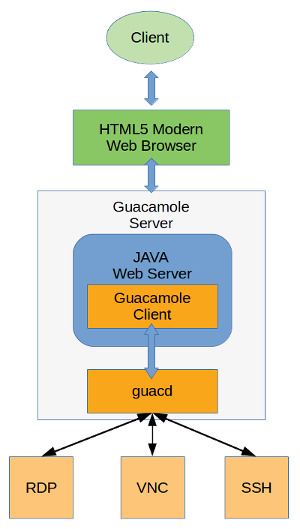 Once you add remote servers in Guacamole, you will only need a web browser to access them from anywhere in the world. Published at DZone with permission of Liptan Biswas , DZone MVB. See the original article here.